GCD Studios + Melody Ross = Artsy Urban & 2 GIVEAWAYS! At the end of September, GCD Studios announced that they had acquired Melody Ross as new product designer. You may know Melody as the founder of Chatterbox. With this in mind, you know this woman has some amazing talent! The new line she has come with is called Artsy Urban. It is whimsical, glittery and has a bit of a shabby chic feel to it. A few of our reporters were able to work with the 12x12 page kit and these are the projects they made and what they thought of the new line! 3. The packet was all inclusive with everything you'd need to make a page. 1. I didn't prefer the realistic (photo style) patterned papers... just not my thing. 2. The included alphabet was yellow, yet a lot of the patterned papers were yellow. Makes it hard to use the alphabet when they're the same color as the paper. 3. Some of the glitter distribution on the transparency pieces was oddly placed and took away from the overall appeal of a few of the pieces. *I used all of their products except... ticket: Creative Imaginations, and QuicKutz die for letters. 1. 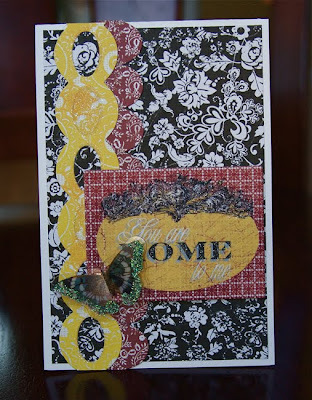 I really like the chipboard sentiments! 2. I love the tight patterns and colors. 3. I really liked all the pre-cut borders that are available in this kit. 1. I like the glitter, but sometimes it seemed to overwhelm the item. 2. The yellow alpha stickers were not to my taste. Just a bit too much for me. 1. Hello?! Glitter, flocking and raised embossing? What isn't there to like? Amazing texture. 2. The color combination is really fresh and exciting. 3. I love the strips of pattern paper. The scallops and the shapes are very cool. 1. A few of the images on the paper and on the chipboard are not as crisp as I like. 2. I wish the big butterfly on one of the pattern papers was whole instead of cut off. I wanted to cut it out and use it on my page, but I couldn't. 3. I think that the crocheted flowers should come with coordinating brads. 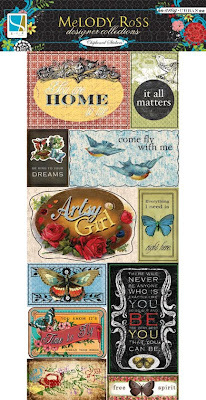 This line has a 12x12 pad, 8x8 pad, a mat pad, borders, paper clips, border, epoxy stickers, buttons, bling stickers, butterfly stickers, chipboard, overlays, metal tags, and crocheted embellies! What do you think? Is this something you are excited about? Is it your style or not so much? Leave us a comment by noon EST on Tuesday and you will be entered to win one of TWO prizes! One winner will receive a 12x12 pad of Artsy Urban paper and the other winner will receive all 15 embellishments and 1 mini album! This kit looks interesting. I like some of it and some is not quite my style. Thanks for a chance to win. WOW! love this stuff! Thanks for sharing! From the pictures I like the kit - the colors, the textures - looks like a lot of fun. The posted layouts are amazing and very inspiring. I'm thrilled to know Melody is still creating. I'll check out my Michael's this afternoon-there are several items I would love to have. Very cool! I love what you all did with the elements! Thanks for the chance. Beautiful papers and looks like some thing that I would LOVE to try out!! Thanks for a chance to win some great goodies!! I sure wish I could make layouts like these. So much talent! And the giveaway is a terrific way to try some new products! Thanks for thinking of us! I love the look of the papers and the precut borders. The colors really pop! WOW...I really like this! Would luv to have an opportunity to try this line. Thanks for the great review. I like the look of this set - love the colors - Artsy Urban - who would of thought! I love the colors. I can't quite say if it is my style since I am still finding my style ; ) But the kit looks very cute. looks like such a great line! and like Bethany said- glitter, flocking, raised embossing- oh yea! love the birds and the butterflies. looks like a line that would be fun to use bits and pieces to pump up a page. New to your blog...so glad I came by! I love GCD papers...they cause me to work 'outside the box' for sure! Will be back for another visit! I love the muted colors - looks like something I would love to work with!! Thanks! I was a big Chatterbox and am a huge GCD fan. I am happy to see Melody Ross is back at it again. 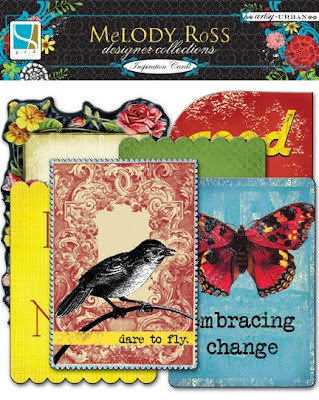 I have been loving the papers she designed for the Scarlet Lime kits, I am anxious to pick this line up! I love this line. I think it is gorgeous with the colors they used. I would love to win a set! your creations were amazing!! I have one GCD paper collection and they are really great papers! I agree with the designers--the colors look great and so do the sayings. I'd like to use some of these items, but I'm personally not big on glittered pieces, so I'd probably skip those. Love the look. So different from their other lines. 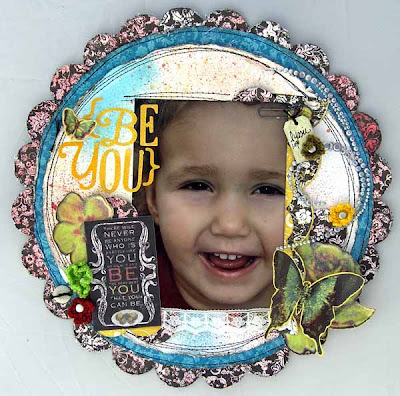 I love the glitter effect with the blended colors and patterns. Well this looks just gorgeous and perfect for heritage-type LOs. Glad to hear about the pros and cons so I'm not surprised if I pick this line up. Thanks! So artsy...I LOVE IT!! Thank you for the opportunity to win! I saw this line on the gcd blog the day they revealed it and I LOVED what I saw!! I think you ladies totally rocked this line and I really appreciate your honesty, I'm very interested to find some and see it irl!!!! Thanks for the review!! I absolutely love this, the colours and patterns are divine. I think this is really a nice line that is different enough from the other stuff out there to really stand out. Very interesting! I really like Melody! I am so glad that she has jumped in to create this line! Actually, I think their line is pretty cool looking! I THINK it looks VERY COOL! COUD THINK OF SEVERAL THINGS TO CREATE! THANKS FOR THE CHANCE TO WIN! I'm glad to see Melody creating again and have in the past been a big fan. These products seem a bit dated. They are cute and I'm a huge fan of glitter and flock but something seems just sort of off. Maybe the colors are not translating well, maybe I've just become bored with canned saying on layouts..I don't know. I'll be looking for them at M's to see if they have more wow factor IRL. Thanks for the heads up on the new product. 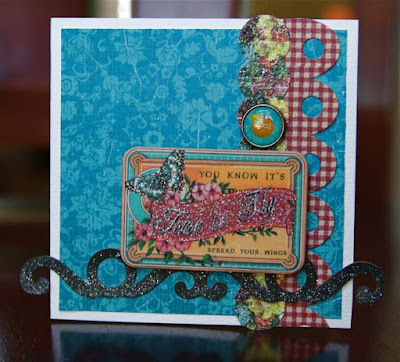 I am very drawn to this line...love the combo of vintage, combined with bold colors. Thanks for a chance to win! Would love to make some cards with these products. This kit looks fresh and exciting! I can see the patterns and colors will challenge even the shabbiest creators. Thanks for the chance to win. Wow you girls did a fabulous job with this new line! I saw this on the GCD blog thought I would like it there but you guys rocked this and I love what I am seeing! I have already went to my Michaels and was so disappointed that they don't have this line - of course,small town :( but maybe I can win some!!! Thanks for the oppertunity! I like to challenge myself with new things so even though this doesn't seem my style at first, i'd love to try it!! 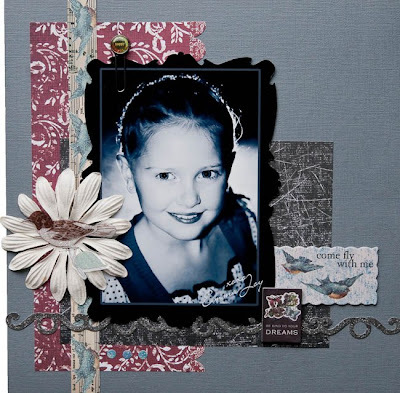 It's not really my style, but there are some things I'm sure I could use, even if it is for cards and not scrapbooking. It's beautiful stuff--just not too ME. This has been a wonderful review. Thanks for the honesty -- I agree that at first glance I would say "not my style," but my creative curiosity has been piqued.... I just wonder what I could make of this kit??? Who knows, maybe I'll get a chance to find out ;) Thanks for the giveaway! I would love the opportunity to try this product, it would definitely be going outside the box for me, and that's not always a bad thing! Using this style of paper would be a new creative challenge for me. I certainly would love to give it a chance. This is collection is very cool. I'm a huge fan of reds & blacks so despite the comments about the yellow alphas, I think they'd be right up my alley! Plus, you can't go wrong with glitter and butterflies! Wow! This is a beautiful line. She is very talented! I would love to get my hands on this, But unfortunately I dont live anywhere near a M's! Errrr, Maybe I can find it next time we go on a vacation! I would really love to play with this collection. It is totally my style. As for the yellow alpha's I think a little pen outlining or distress ink would make them stick out a bit more. This kit looks awesome - not normally the colours I use but can see heaps of potential for creating!! Melody Ross is amazing! I LOVE this collection and could think of a lot of photos I could use it with. Thanks for the reviews! I love the color combo and I think the entire collection looks fantastic!! I would probably like some of the images to be a bit more clear. Other than that....LOVIN' it!! It is not my style, but still gorgeous. I like trying products that aren't my typical go-to things. I used one of their other line, and really liked how versatile it all was - the glitter, embossing and flocking sounds fabulous! The realistic looking art is a bit out of the box for me, but I think it would be a lot of fun to work with!! I've never gotten into buying kits - mostly because I don't use all the items. I'd be interested in seeing how these could fit with my photos. Thanks for the chance to win! I hadn't seen this before and I really love the colors and that it is different from my regular style. I like this new line a lot. It is different or me but that us also what I like about it. Those products are definitely out of the box from my usual scrappin style but it would be nice to do something different for a change. I have always loved Melody Ross and look forward to seeing other new products from her. Great layouts, but this line is sooooo NOT my style!! 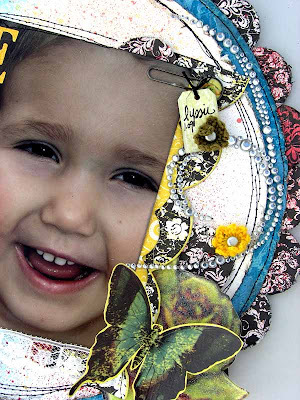 i love the embellishments, the colors look fun to play with too. I would love to match up some bright colors with them. I've never used anything like this, but it looks fun to work with! Love glitter & butterflies, so this line sounds wonderful! 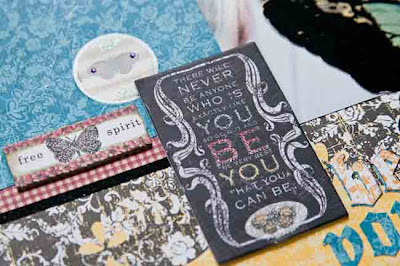 This stuff is very whimsical and can stretch your creativity! I'd love to try it out for myself! Thanks for the chance to win! Love the pieces with the birds especially. I don't know that I would use the entire line together, because too much of the style might be overwhelming, but then again, the designs by TSR team are awesome! 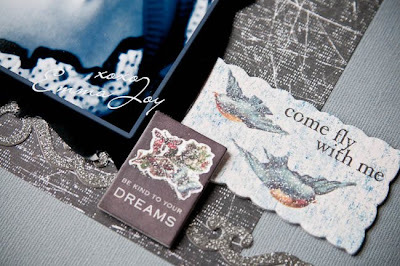 From the pictures this looks like the paper is right up my alley-soft and textured but it doesn't sound like that may be the case-I love the chipboard with wording-I'm a huge quote person But I'm hoping my store will be one of the one's to get the line so I can check it out! 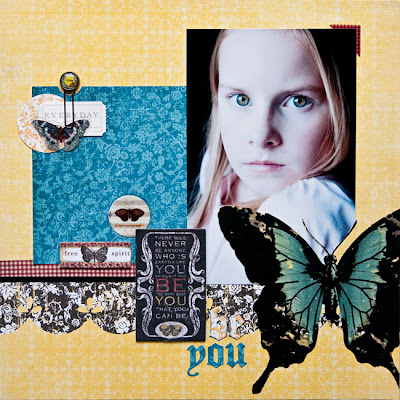 I love the paper, I am really into the shabby chic style right now and I love the butterflies. I haven't played a lot with glitter but I am always up for trying something new. Over all, love the line! This doesn't really look like my usual style, but I really like what you gals did with the products! I do like the butterflies and I think I could use those for lots of things! I really like this kit. I am getting into the shabby chic, vintage looks that are everywhere now. I never would have thought I would like it so much but I really do. This line looks great and I would love to win it :)!!! I think those embellishments are to die for. I'd love to get my scrappy little hands on them. Thanks for showing us! 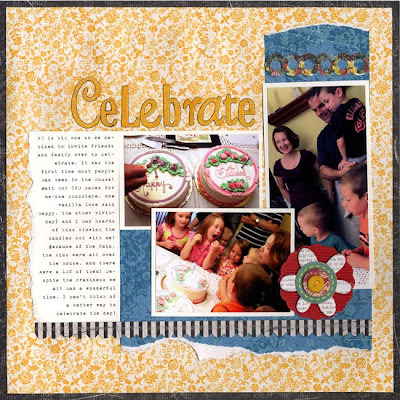 when this first came out I wasn't fond at all of it, it really wasn't me, but the more I see it the more I think the colours are so useable, especially that fresh yellow with the more vintage embellishments. Give me another week i reckon I'll love it all. This looks fab. Love the colors and patterns of that paper. I'll be headed to Micheal's this weekend!!! Such cute stuff! And the items made by these talented women---WOW! Always love the inspiration found here! Thank you!!!! 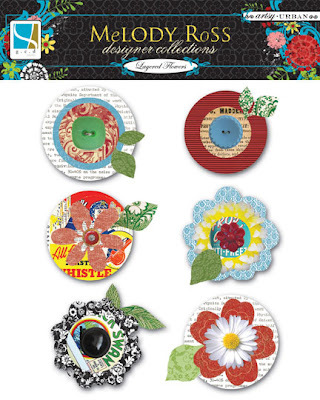 I had heard they were using Melody Ross designs--very cool. I will have to check them out at Michaels. I love the embellishments! Have seen them used on several projects of blogs I visit. I LOVE these papers and would really like to win some :)Hope I'm not too late!